I said I’d NEVER have another chicken. I have over 60 at this particular moment. 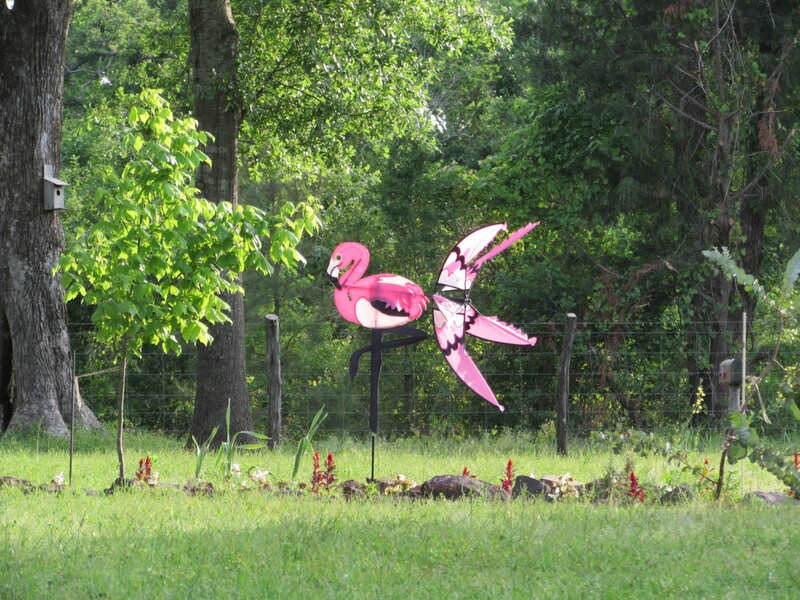 And I said I’d NEVER have a pink flamingo in my yard or any other kind of tacky whirly-thing. And I DON’T have one in my yard. It is in my flower bed. Yet, when faced with a big set of baby blue’s in my 4 year old daughter’s adorable head threatening crocodile tears if we didn’t bring the damn thing home, assemble it and let it whirl for all to see……..I’m willing to bet you’d have a pink flamingo too. I’m sure your daughter really appreciates that you brought this home and put it together. She should be happy that she doesn’t live around here. The homeowner’s association (HOA) wouldn’t allow it.